Okay, first of all, I just had a major revelation. Has anyone else been SUPER frustrated with Facebook lately? I feel like none of the pages I actually “liked” and want to see are showing up in my newsfeed and all sorts of crap I have ZERO interest in is clogging it up. I know a lot of you have mentioned that you aren’t getting OBB updates anymore and I truly don’t know how to remedy that. I made a discovery tonight. And voila! There are all the pages you’ve liked, subscribed to, wondered if they fell off the face of the planet. So if you’ve pondered our sudden disappearance from Facebook (or the disappearance of any of your other favorite blogs/pages/people/whatevers) have gone, we’re still here, I promise! I love ribs. We’ve talked about this before. In addition to my love for ribs, I feel very strongly that they should be eaten caveman-style with no forks or knives. When it comes to ribs, pizza, burgers, and Snickers bars, table etiquette goes out the window. Anyone who has spent even a little time with me knows that I run on sleepless nights and Diet Coke. When I was in college (another time when I ran on sleepless nights and Diet Coke, which was no small feat since caffeine wasn’t sold on campus), a friend taught me how to mix Diet Coke with a little fruit punch or juice and it became one of my favorite things. So when I started thinking of a new way of cooking ribs, I thought that would be such an amazing flavor combo. Except that you can’t cook with Diet Coke because cooking with Diet Coke is gross and, if you’re talking about glazing something, you’d need the sugar from regular Coke. 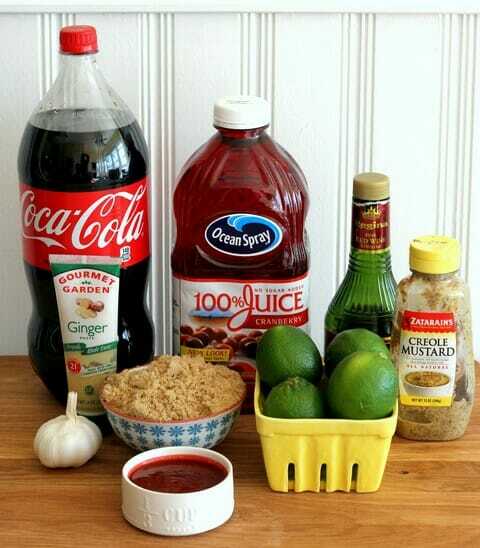 You’re going to need NON-DIET Coke (or Pepsi…I guess…), cranberry juice (100% juice, not juice cocktail), brown sugar, freshly squeezed lime juice, red wine vinegar, fresh garlic, fresh ginger, Creole mustard (or other mild grainy mustard), and some canned chipotle sauce. Try and find a small can of just plain chipotle sauce that doesn’t have the peppers in it–it tends to be milder and it’s easier to measure out what you need. 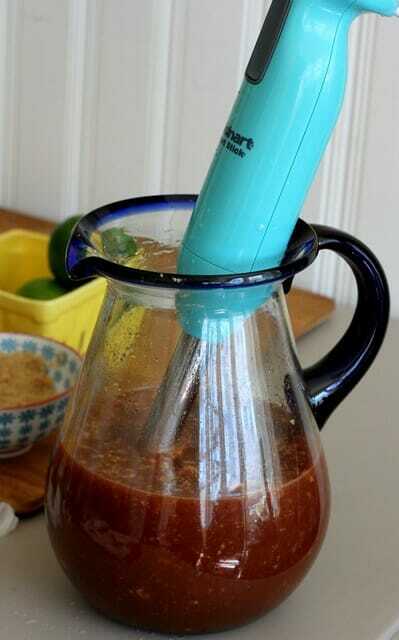 Combine all the ingredients except for the liquid smoke and the ribs in the jar of your blender or, if you have an immersion blender, in a pitcher. Blend until the ingredients are combined. Reserve 1 cup of the liquid per rack of ribs (if making a lot, you may want to double the recipe–better to have too much than not enough). Now…you can either pre-cook the ribs in the oven or in your crockpot, depending on what’s easier for you. The oven method cooks faster, but with the crockpot, you can cook them all day and then finish them off right before dinner. So just do whatever’s easiest for you. If you’re making these in the oven, preheat oven to 300. 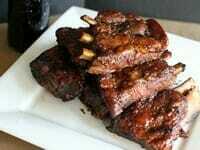 Cut the ribs into portions that have 2-3 bones per portion. Place in a heavy lidded pot or Dutch oven (don’t use a baking dish covered with foil–it won’t retain enough heat and the ribs won’t be as tender) or in the crockpot. Pour the unreserved liquid over the ribs, cover, and cook for 2 1/2-3 hours in the oven (about 6-8 hours on low in the crockpot) or until the meat is very tender (you may want to turn the ribs halfway through the cooking time, especially if they’re not all completely covered by the liquid). 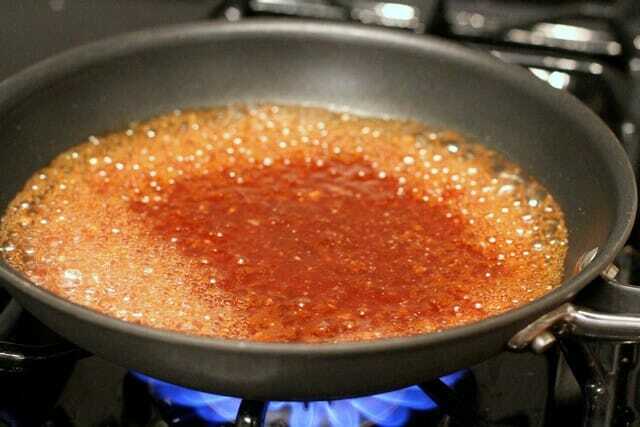 Place the reserved liquid in a small saucepan or skillet. Cook over medium-high heat, stirring frequently, for 5-7 minutes or until the liquid is starting to reduce and thicken slightly (if you’re starting with 1 cup, you want to reduce it by about 1/4 cup). and cook on the heated grill or under the broiler for 3-5 minutes or until the ribs are shiny and glazed. Flip the ribs and brush the opposite side with the remaining glaze and cook for another 3-5 minutes, being careful not to scorch the ribs. They should just be fall-off-the-bone tender. Serve immediately. 1 rack serves about 2-3 adults. Fall off the bonder tender and full of flavor, these make a great meal year round! Combine all the ingredients except for the liquid smoke and the ribs in the jar of your blender or, if you have an immersion blender, in a pitcher. Blend until the ingredients are combined. Reserve 1 cup of the liquid per rack of ribs (if making a lot, you may want to double the recipe–better to have too much than not enough). Preheat oven to 300. 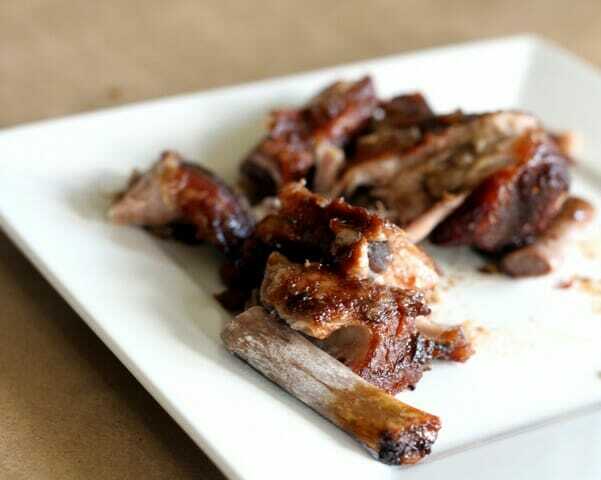 Cut the ribs into portions that have 2-3 bones per portion. Place in a heavy lidded pot or Dutch oven (don’t use a baking dish covered with foil–it won’t retain enough heat and the ribs won’t be as tender). Pour the unreserved liquid over the ribs, cover, and cook for 2 1/2-3 hours or until the meat is very tender (you may want to turn the ribs halfway through the cooking time, especially if they’re not all completely covered by the liquid). Place the reserved liquid in a small saucepan or skillet. Cook over medium-high heat, stirring frequently, for 5-7 minutes or until the liquid is starting to reduce and thicken slightly (if you’re starting with 1 cup, you want to reduce it by about 1/4 cup). Remove from heat and set aside. When the ribs are done braising, remove the pot from the oven and carefully transfer the ribs to a foil-lined pan. 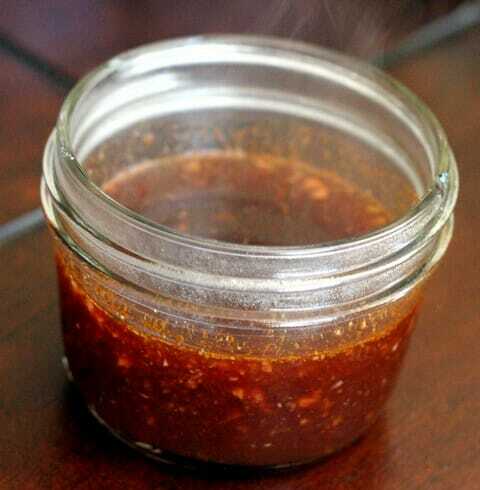 Sprinkle with liquid smoke or smoked paprika. Either turn the broiler on your oven to high or heat an outdoor grill to medium-high heat. Brush one side of the ribs with half of the reduced glaze and cook on the heated grill or under the broiler for 3-5 minutes or until the ribs are shiny and glazed. Flip the ribs and brush the opposite side with the remaining glaze and cook for another 3-5 minutes, being careful not to scorch the ribs. Serve immediately. 1 rack serves about 2-3 adults. 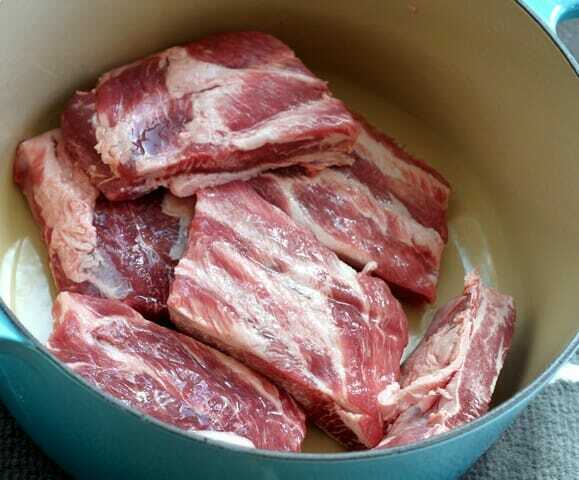 Cut the ribs into portions that have 2-3 bones per portion. Place in a slow cooker. Pour the unreserved liquid over the ribs, cover, and cook on low for 6-8 hours or until the meat is very tender (you may want to turn the ribs halfway through the cooking time, especially if they’re not all completely covered by the liquid). When the ribs are done braising, remove the pot from the oven and carefully transfer the ribs to a foil-lined pan. Sprinkle the ribs with liquid smoke or smoked paprika. Either turn the broiler on your oven to high or heat an outdoor grill to medium-high heat. Brush one side of the ribs with half of the reduced glaze and cook on the heated grill or under the broiler for 3-5 minutes or until the ribs are shiny and glazed. Flip the ribs and brush the opposite side with the remaining glaze and cook for another 3-5 minutes, being careful not to scorch the ribs. Serve immediately. 1 rack serves about 2-3 adults. ah ha! I was wondering what to make to go with the potatoes you just posted. Thanks, weekend dinner dilemma solved. I enjoy reading your posts –you are so witty and have a funny outlook on life. Thank you for the great recipes! – At the top of the feed, under the status bar, you’ll see a line that says “Sort” – click it to say “Most Recent” rather than top stories. This helps make sure you see everything that’s posted. – When you “Like” a page or a friend a person, you can hold the click over the Like or Friends button and a drop down menu will show up, wherein you can select “Show in News Feed” to make sure they end up in your news feed (or deselect it for any crap you want to reduce). I share these tips after ENDLESS hours of frustration with FB. Hope they’re helpful to someone else out there! Also, when you are looking at your newsfeed, and you see a story or a group that you don’t care about anymore, go the the very top right corner of the story. There should be a little arrow – you can click it, and choose “hide”. It will then give you the options to hide just that story, hide all from that group, or unlike the page/group altogether. 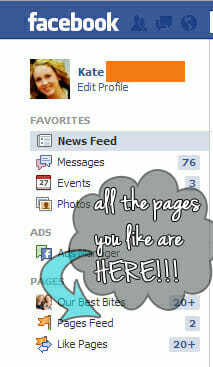 Very useful for quickly cleaning up your newsfeed without visiting each individual page! Yum! These look great. I’ve decided that the vast majority of moms with young kids run on sleepless nights and diet coke. You’re not alone! This looks delish! Just wanted to let you know that I’m featuring your amazing “Cowboy Quesadillas” over on my blog today! 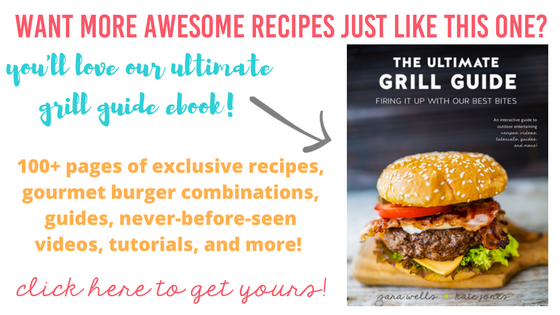 Thanks for all the yummy recipes! Yea! I love a bonus post on a Thursday! Yummy! Love bonus posts! You girls are the BEST! Why yes facebook has been annoying me lately… too many sponsored ads in my feed. but i follow most blogs with google reader so i never miss a post. these ribs soynd really good except for the soda- whats a good replacement – i dont like soda or caffeine much for that matter? Have you ever made diet coke brownies??? If not, give itca shot. They afe better than using your traditional butter, oil, or eggs… Yeah I said it..
-I based this recipe on that one. -The marinade of that one is SO delicious, but they you don’t finish it off with it, so it kind of gets lost. This recipe uses all that flavorful stuff as the glaze, too, so you really get that flavor. I honestly think it’s a toss-up. They’re both awesome and you can’t go wrong either way. Yay for delicious sounding bonus posts! I’ve tried that with other blogs I follow and it doesn’t work, at least not 100% of the time. I’ve even tried unsubscribing and re-subscribing and they still don’t show up in my feed. It’s SO frustrating!! This looks awesome! We love ribs and I’m with you, they definitely should be eaten caveman style :). Insanely delicious! We don’t eat ribs, so I was wondering if I can use this recipe for chicken thighs or wings? TOTALLY. I would try it with a whole chicken quartered, or maybe chicken legs. Kate, first, these ribs look awesome! I love your other ribs, too, so I am sure these will be a hit, but more importantly, about the Diet Coke discussion. My very favorite combo is Diet Coke with a little splash of that Pina Colada “juice” they have at most Mexican restaurants by the Orange BANG! juice and whatever else. (Specifically, here in Utah, I get it at Bajio.) I know a lot of people add coconut and lime and it is now famously referred to the “Dirty Diet Coke” but I sure love the milky pina colada twist. Yum. I wonder if I can find that stuff to do at home, I have never even tried just because I am a fountain Diet Coke snob and kind of resent having to drink the cans at home. The Diet Coke discussion is ALWAYS more important. Your mix sounds AMAZING. Also, would it be over-the-top to install a machine that makes ice AND dispenses Diet Coke? Don’t think I haven’t thought of it. I’m planning on assembling some freezer crock pot meals tomorrow. Would this one work in the freezer? For sure. I would put the ribs in the marinade and freeze it like that with a little ziploc bag or cup with the reserved marinade. Hope that helps! I made these tonight with homemade macaroni and cheese and it was one of the best things I’ve ever made! And if you find a way to install a Diet Coke fountain, you’ll have to let us in on that secret too! So just how many ribs can you fit in a crockpot?! It definitely depends on your crockpot. Your average 4-5 quart crockpot can comfortably hold 2 racks, maybe a little more if you’re feeling brave. I made these in my 7 1/2-quart Le Creuset and it could have easily held 3 racks, maybe a bit more. I’m not a fan of baby back ribs but your pictures made me drool for some. So I made this last night for our Sunday dinner. It was a hit with the whole family and even I loved it! My hubby asked me to make this again. Thanks for sharing the recipe!! I can’t find chipotle sauce anywhere, help! I bought chipotle peppers in adobe sauce, think I could mix it in a blender and substitute? 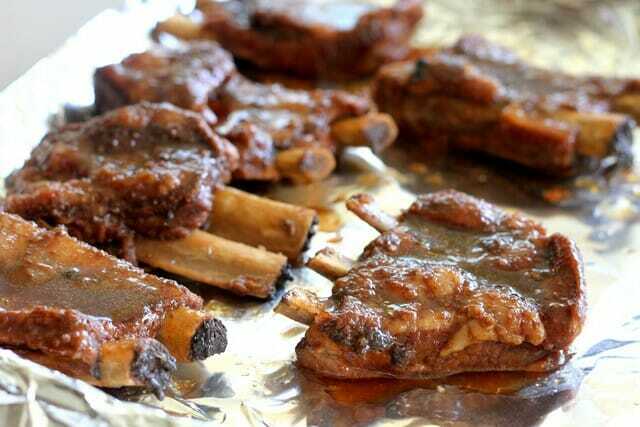 This look so yum, I can’t wait until ribs go on sale and I can make them! I, too, believe that ribs should be eaten caveman style. My kids give me crazy looks when I eat ribs – it’s the only time I am not insisting on utensils! I made this recipe this weekend with a pork shoulder instead of the ribs and served it on buns for pulled pork sandwiches. It was absolutely divine!!! I kept the marinade/sauce measurements the same and reserved some to serve on the sandwiches. I did salt and pepper the shoulder and sear it in a pan before adding it to my Dutch oven, but followed everything else and it was one of the best pulled pork sandwiches I’ve ever had (even my 10-year-old loved them!) Thanks for another delicious recipe! Tried these tonight. Without the chipotle. Unbelievably delicious. Whole family loved them.